We are given advice by people who are motivated by love and joy to help transform our land and peoples towards justice and peace. 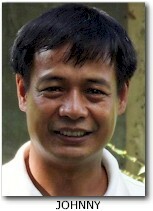 Dann (aka Lakan Sumulong) studied theology at Febias College (B.A., 1979). 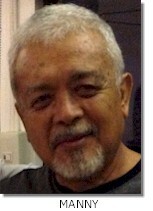 He finished Asian Studies at the University of the Philippines (M.A., 1982). While serving as a pastor in Olongapo City, he was politically active against the Marcos dictatorial rule. In 1986, he and his family migrated to Canada. In 1989, he began serving as Lead Pastor at Grace International Baptist Church in Vancouver, BC. 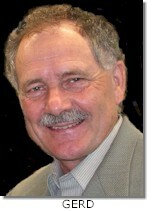 Dann was appointed in 1995 as Director of Global Ministries of the Baptist General Conference of Canada. 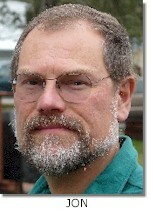 In 2002, he finished his Master of Theology degree from VST, University of British Columbia. Peace Mennonite Church in Richmond, BC commissioned him and his wife, Joji, to the Philippines as International Witness Workers in 2006 in partnership with Mennonite Church Canada. PeaceBuilders Community was conceptualized when Gerd invited Dann for a coffee fellowship one cold February morning in Richmond, British Columbia. The year was 2004. A piece of table napkin with notes and scribbles became the first minutes towards the creation of PBCI. Gerd was Mennonite Church Canada’s Director of Resource Development – Western Canada, a job he describes as primarily visiting and saying “thank you” to the generous donors who support national church ministries. He fundraised for the church and its institutions on and off for 30 years. Pastor Norman has been serving as our spiritual adviser from the first day of PBCI. He earned a Master of Divinity (with honours) from the Asian Theological Seminary in Quezon City. In 2010, Norman was invited to visit Canada to participate in a pastors conference. There, he was immersed in Peace Theology, saw its impact in the Canadian society, and started asking what it means to be a follower of the Prince of Peace in a conflicted land like the Philippines. THE HON. 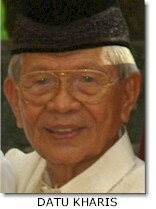 DATU KHARIS M. BARAGUIR, SR.
Datu Kharis was the first elected Vice Governor of the Province of Maguindanao. He is a devout Muslim and a respected elder coming from the Maguindanao’s traditional leadership family. He is a man of peace whom we look up to as our adopted father. All staff and volunteers of PeaceBuilders Community, local and global, are required to go through Datu Kharis’ orientation on Mindanao Peace Process from the Bangsamoro perspective. Asked what motivates him to work with a Christian peace building community like us: Islam is a religion of peace (salaam). It is consistent with Islamic teaching to be friends and co-workers of the People of the Book who truly practice the ethical principles of their faith. I am a Muslim member of PeaceBuilders Community. 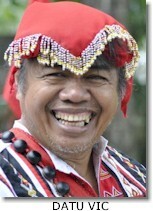 Datu Vic is a respected leader among the Indigenous Peoples (IP) of Mindanao. He is the Spiritual Leader of the Talaandig Tribe of Bukidnon, a first nation occupying their ancestral territory around Mount Kitanglad in unity with the Higaonon and Bukidnon communities. Datu Vic is also the administrator of the Apu Agbibilin Community, Inc. and a member of the Council of Elders of the Mindanao Peoples’ Caucus. PBCI consults him in our strategic decisions when IP issues are involved. Asked how he looks at life and reality as a Talaandig elder: I am an Indigenous Person and live according to indigenous worldview. My faith is indigenous as well and my knowledge system is nurtured by common sense. I submit myself to the laws of nature and live with it. Everyday I keep on searching my relationships with the world, its elements and people. It is really nice and enjoyable! Pastor Manny leads the Bayani Simbalay, a network of house churches in Bukidnon who advances the transforming power of the Gospel in all aspects of life. An alumnus of the University of the Philippines in Los Baños, he is also an inventor and entrepreneur. In 2002, he was recognized and honored with the Outstanding Research and Development in Industry and Energy Award by the Department of Science and Technology. He’s also the President & CEO of Sidlak Pinoy, Inc. – one of the country’s leading designers and producers of state-of-the-art agro-industrial machineries and technologies. 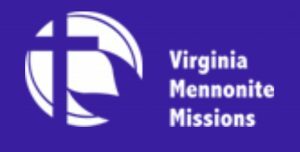 Wendy was a consultant when Dann & Joji Pantoja were being considered in 2005 by Mennonite Church Canada as peacebuilding missionaries to the Philippines. 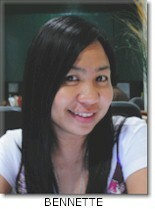 For the past 10 years, she has been serving as our occasional training facilitator for staff development. She also accompanied us in various fields of operations as we facilitate peace dialogues between parties in dispute in Mindanao’s armed-conflicted areas. 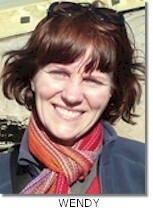 She is currently the Co-Director of the Canadian School of Peacebuilding at the Canadian Mennonite University in Winnipeg. 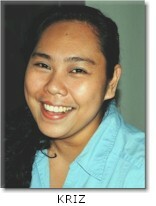 Wendy comes back to Davao City every year to teach at the Mindanao Peacebuilding Institute. We call him Kuya Mar. Kuya is a Pilipino term of endearment for respectable older brother. 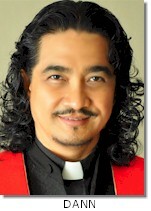 Kuya Mar is a graduate of Vanderbilt University Divinity School in Nashville, Tennessee. He is the author of Revolutionary Spirituality: A Study of the Protestant Role in the American Colonial Rule in the Philippines (New Day Publishers, 1999), and The Dream Need Not Die: Revolutionary Spirituality 2 (New Day Publishers, 2000). Asked what gives him hope for PAR Community Development: With Jesus as the ground of communion and chief cornerstone of hope, the people of God can remember the future—meaning, they can transcend their fears, limitations and frailties; they can overcome their selfishness, greed and apprehensions; they can form fellowships of reconciliation and concords of peace; and they can establish communities for self-sacrificing service of the most noble and divine kind. 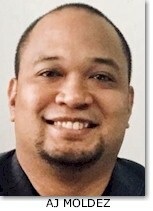 Professor Aldrin Penamora completed his Doctor of Philosophy in Christian Social Theology and Ethics from Fuller Seminary in Pasadena, California. 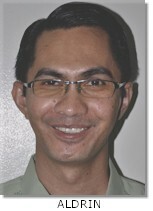 He serves as the Manager of Christian-Muslim Research Center of the Philippine Council of Evangelical Churches (PCEC). Aldrin also helps us — leaders, staff, and volunteers of PeaceBuilders Community — as we think biblically through the various justice and peace issues we are facing in advancing Peace and Reconciliation in the Philippines. Asked how he can help the peace processes in Mindanao and how he considers the risks involved: As a Christian theologian and ethicist, I think I can be of help to PBCI in terms of theologically equipping its members. I believe I must be prepared to also suffer in following Jesus, who was persecuted and crucified. If the Lord will call me to suffer for His name, then I only pray that he give me the strength to rejoice in participating in Christ’s sufferings (1 Pet. 4:13). Jon is currently the Peacemaker-in-Residence for Elizabethtown College’s Center for Global Understanding and Peacemaking. With more than 25 years of working in 30 countries in Asia and Africa, Jon has focused his efforts at peacebuilding and conflict transformation on a grass roots and middle-out communities. 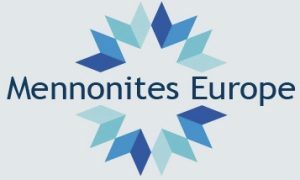 Jon has an MA in Religion with a Graduate Certificate in Conflict Transformation from Eastern Mennonite University in Harrisonburg, Virginia. 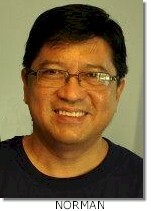 Joji graduated from the University of Santo Tomas (B.Sc., 1979). 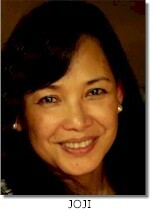 She also studied International Relations at the University of the Philippines. 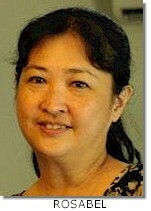 She moved to Canada in 1986 and since then developed a successful career in the investment and financial industry. She returned to the Philippines in 2006 and since then established and led our inclusive development initiative — Coffee For Peace Corp. (CfPC). As the CEO of CfPC, she became the Women Entrepreneur Winner of CitiBank-Business in Development Network, Philippines in 2010. She also received, in 2015, an N-Peace Award from the United Nations Development Program – Impact Investment Exchange Asia (UNDP-IIXAsia) in behalf of the women who comprise the 80 percent of the farming farmers of Coffee For Peace, Inc. She was invited for the N-Peace Awards Ceremony at One UN Hotel, New York, NY. In October of 2017, Lakambini completed her Master of Entrepreneurship in Social Enterprise Development, Ateneo de Manila University – Graduate School of Business. Malou brings a healthy mix of traditional indigenous wisdom and modern scientific knowledge in this Peace and Reconciliation (PAR) movement. Her vision is to integrate PAR principles and practices in the educational system, in social entrepreneurship, and in public administration. Her educational training — Bachelor of Arts in Mass Communication and Master of Arts in Public Administration — prepared her well for this vision. Her PAR dreams and energies are mostly channeled through her work as Associate Professor of Public Administration at the Kalinga State University in Tabuk City. 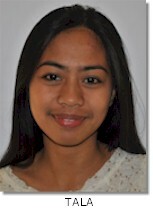 Rosabel is one of the original incorporators of PeaceBuilders Community. She has been contributing in the growth of this organization through her expertise in mining and geology as it impacts the economy and ecology of Mindanao and the Philippines. A graduate of the University of the Philippines in Diliman, she is aware of the justice issues in the Philippine mining industry. After finishing our advanced course in peace and reconciliation training, PBCI commissioned her to make a study of the mining issues from the perspective of our Shalom Theology. 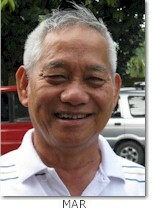 Joseph is known among pastors and Christian leaders in the Philippines as an effective leadership development teacher. He’s ‘Boyet’ to his family and friends. He completed his bachelors degree in Development Communications and masters degree in Development Management from the University of the Philippines. He currently serves as Director for Transformational Development at the Asian School of Development and Cross-Cultural Studies (ASDECS). Asked about his perspective of our connections as human beings, he said: Where ever we are and regardless of what we are into, we share the same heart – created in God’s image – with innate value and dignity as human being. Our lives are joined together and we share each others’ joy as well as pain. Johnny is employed as Community Affairs Officer at the Office of the Provincial Vice Governor, Province of Kalinga. He is also serving as an Elder of a local congregation of the Christian and Missionary Alliance Churches of the Philippines in Tabuk City. In the 1990s, he was a leader of a revolutionary movement that has been fighting for the liberation of the indigenous peoples of the Cordillera Region. During that time, he served as Deputy Secretary General of the Cordillera Peoples’ Alliance (CPA) for the Defense of Ancestral Domain and for Self-Determination. 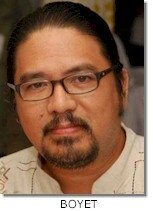 Johnny finished his Law degree in March 1993 from San Sebastian College-Recoletos in Manila. Prior to his Law education, he completed his Bachelor of Arts degree (Political Science and Economics) in March 1985, from Trinity College in Quezon City. 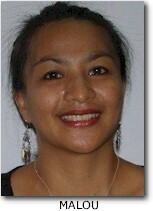 Bennette served as our Director of Support Operations for several years. She made sure that our field workers — both paid and volunteer staff — were adequately cared for through her administrative and financial management skills. In those times of emergencies due to war and natural disasters, Bennette and her team proved to be efficient and effective in their logistical operations. She’s now running her own inclusive business with her husband. Bennette also serves as Vice President for Public Relations at Coffee for Peace Corp.
Ustadz Abdulkadir is the Executive Director of the Bangsamoro Development and Resource Center (BDRC), our partner in Values Enhancement Training (VET) among the Islamic leaders around the Ligawasan Marsh. 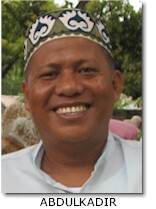 Most of our relationships around Ligawasan (Marsh Lands) are through the facilitation of Ustadz Abdulkadir. Asked about the importance of the Values Enhancement Training (VET) in the context of Mindanao: The continuous war heightened the biases and prejudices between Muslims and Christians in Mindanao. This grim and morbid scenario of war leads to the theoretical framework of first VET to delve on the Muslim-Christian Dialogue. VET provides space for wider understanding, analyzing and interpreting the tenets of Islam and exerts positive and harmonious relationship between Muslims and Christians especially in the conflict affected communities. 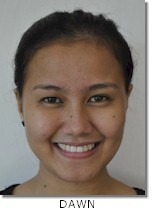 Sharon is a faculty member at the main campus of Mindanao State University in the City of Marawi, Lanao del Sur. Some of the courses she has been teaching are Philippine History and Institutions, Life and Works of Rizal, and History of the Filipino Muslims and the Lumads. As a young scholar with passion in social and historical research, Sharon helps PBCI as we seek to contribute in telling a story of Mindanao that is peace-oriented, and owned by all the people-groups in our beautiful island. Asked why she’s joining a small organization like PeaceBuilders Community: For me it’s not how old or how big an organization is. It’s what the organization believes in. As an individual I’ll join this small community of peacebuilders for I also believe in the peace and reconciliation being the heart of your ministry. 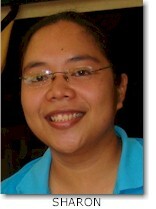 Christine Sumog-oy is known to us as “Mutya Baleleng”. She is currently working on her Master of Arts Program at the Kroc Institute for International Peace Studies at University of Notre Dame in Indiana, USA. We have seen Mutya in action as a legal assistant, as a people movement organizer, as a field documentation videographer, and as disaster response coordinator. We asked her what motivated her to join our community: When I volunteered to assist in the relief operations in 2011 after typhoon Washi struck most parts of Cagayan de Oro and Iligan City and displaced thousands of civilians, I witnessed how PBCI was able to mobilize and inspire committed, like-minded, and kind-hearted volunteers who worked together to save lives and help the survivors in the most appropriate ways. AJ is a graduate of the University of the Philippines—College of Architecture, with a Bachelor of Landscape Architecture degree. He’s the principal at AJM Planning and Design — a collaborative and faith-inspired design studio that is committed to using landscape architecture as a vehicle for peace and reconciliation advocacy. He joined PBCI in 2016 and since then have directed his business and professional activities in support of peace theology and inclusive development. 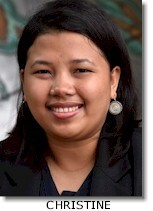 AJ also serves as vice president for innovation planning and design at Coffee for Peace Corp. Asked how landscape architecture relates to peacebuilding, he answered: What I have passionately pursued in the field of landscape architecture is in fact part of ‘peace building’. Through my early explorations of the concept while spending time and resources in Mindanao and Kalinga, the desire to use landscape architecture as a vehicle for peacebuilding has deepened. I adopted the ‘Four Harmonies’ as a design framework that every project we designed as a firm had peace with God, peace with self, peace with others, and peace with creation. Dawn started working with us as a volunteer in 2008. As a member of the University Peace and Reconciliation (UPAR) Team, she helped in peace education activities among students in various universities in Davao City. In 2013, she became a full-time staff member at PBCI. She excels in conceptualizing, organizing, and mobilizing resources for income generating projects to support our peacebuilding work. She’s now serving as an English teacher in Thailand. Asked about how she feels about her role at PBCI: Finding provisions to help in the sustainability program of PBCI is an exciting challenge. All my past experiences—my upbringing, my education, my hobbies, my previous employment—seem to be a preparation to this calling. I believe and I’m passionate in what we, at PBCI, are doing. 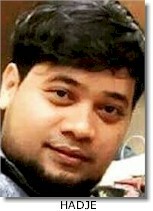 Hadje is currently the vice-president for references of Philippine International Studies Organisation (PhISO), Faculty of Global Studies, Foundation University, Amsterdam. He is also an associate member at the Center for Palestine Studies-SOAS, University of London, UK. Presently, he is taking an international program, Master of Arts in Theology specializing in Intercultural Theology at the Protestant Theological University, Groningen, Netherlands. Asked about his idea of what he would contribute to PBCI: It is my dream to be a part of this organisation. I believe on the vision and mission of PBCI, its advocacy campaigns on creation care, immigration, peace & nonviolence, poverty & justice. Broad enough to include a diverse variety of theological and pastoral perspectives on Peace and Social Transformation. “Kriz is an excellent research staff,” commends a professor at the University of the Philippines. “I would definitely hire her again.” At the very beginning, we invited Kriz to help us start a new kind of peace advocacy. She immediately grasped that what we’re building — a shalom community that also does what many NGOs do. Kriz’s creativity helped us develop the two-pronged features of our office system–support operations and field operations. Asked why she joined a small peace-building outfit like us instead of joining a big international NGO: I think working with PeaceBuilders Community is not just about employment. It’s about learning and growing up spiritually, mentally, socially, culturally and emotionally.